I could never call this salad a low carb dinner, because a necessary part is to serve crusty warm bread alongside. Then I rip off pieces of the bread and make little feta, onion and lettuce sandwiches from my salad bowl. Mix together lemon juice, vinegar, olive oil and oregano to make a vinaigrette. Season with salt and pepper. Put a small amount (1T) of the vinaigrette in a large salad bowl and add your cut up tomatoes, cucumber and onion. Allow the vegetables to marinate for a short time. When you are ready to make the salad. Put your romaine lettuce in the bowl. Add one cube of feta to the remaining vinaigrette and mash with a fork. Pour over the lettuce and vegetables and toss. 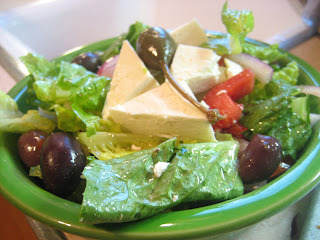 Add the rest of your salad ingredients (olives and feta cheese cubes) Garnish with fresh mint or lemon wedge if you like. I just used the last of my feta in a rissoto experiment. Wish I had waited until I visit here.